Uptown Aces is managed by the same folks who manage SlotoCash and Black Diamond Casino (along with several other gambling portals). It launched in 2014 and has received a lot of attention due to the reputation of the company that runs it, DeckMedia. Like many online casinos, Uptown is licensed in Curacao. The important thing is that it’s open to U.S. players and offers state-of-the-art site security, huge bonuses for new players, daily and weekly promotions, and a long list of deposit methods. As you’ll see in this 2019 Uptown Aces casino review, there are a lot of compelling reasons to register an account. I’ll take you through every important aspect of the casino so you’ll know exactly what to expect when you play there. Let’s start with a high-level overview. At first glance, this bonus is attractive. Nearly $9,000 in “free money” is hard to ignore. And the fact that the first deposit is matched at 250% makes this Welcome Bonus all the more enticing. But it’s important to keep two factors in mind: eligible games and rollover requirements. The bonus money can only be earned out by playing slots, Keno, and Scratch Cards. Blackjack, roulette, craps, and other table games don’t count. Neither does video poker. In other words, you have your work cut out for you. If this $8,888 New Player bonus doesn’t appeal to you, I have good news. You can opt to receive a $1,500 Casino Games bonus. You can claim the first bonus, or both of them. It’s entirely up to you. The good news is that more games count toward earning out these bonuses. But note that not all of them contribute at the same rate. Each $1 you wager on slots counts at 100%. But each $1 you wager on other games counts at only 25%. For example, if you were to wager $400 on blackjack, only $100 of that amount would count toward the rollover requirement. If this $1,500 Casino Games bonus doesn’t appeal to you, you can opt for a “Low Playthrough” Welcome bonus. Uptown Aces will match your first deposit at 100% up to $100 (use the code 100ACES). You’ll only need to wager 15X your deposit plus bonus. Keep in mind, only wagers made on slots, Keno, and Scratch Cards contribute to earning it out. That’s a lot of information to take into account. The most important thing is that you familiarize yourself with the terms and conditions before you choose one of the above bonuses. 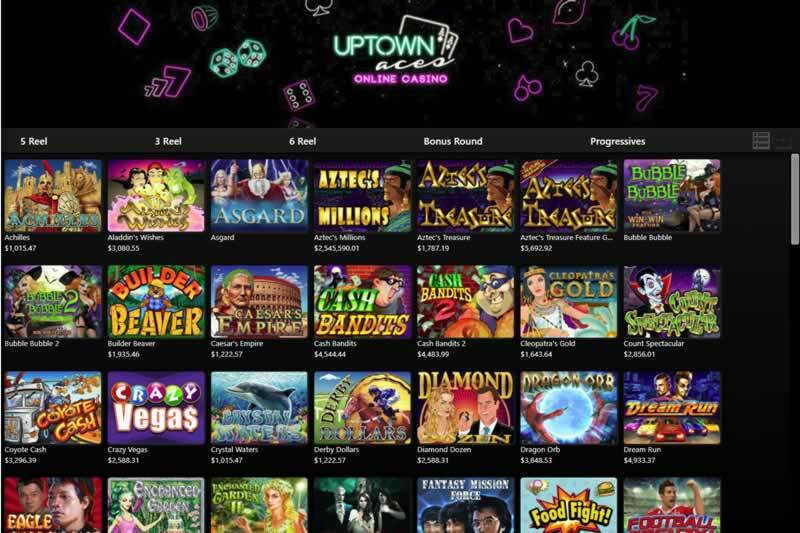 UptownAces offers more than 150 slot games. These include 3-reel, 5-reel, and 6-reel slots. Dozens offer bonus rounds and a few offer progressive jackpots. Following is a small sample of the slots you’ll find at Uptown. If you’re a slots fan, many of these names will be familiar to you. 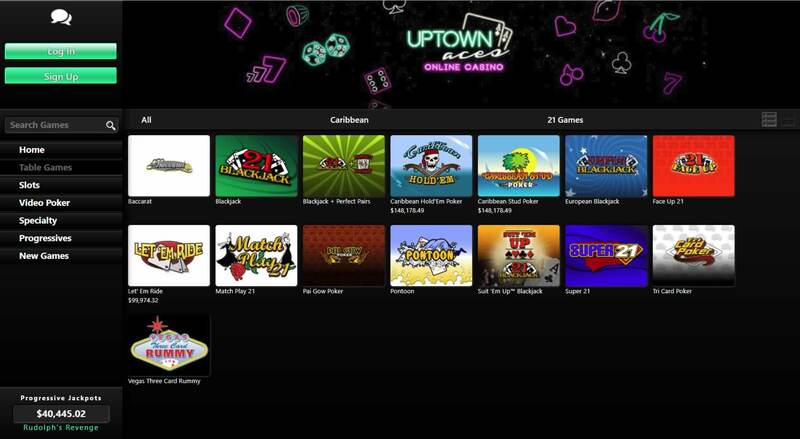 One of the reasons Uptown Aces can offer such a massive variety of games, as well as a flexible bonus program, is because it runs on Realtime Gaming (RTG) software. Realtime Gaming is one of the most respected casino software developers in the industry. 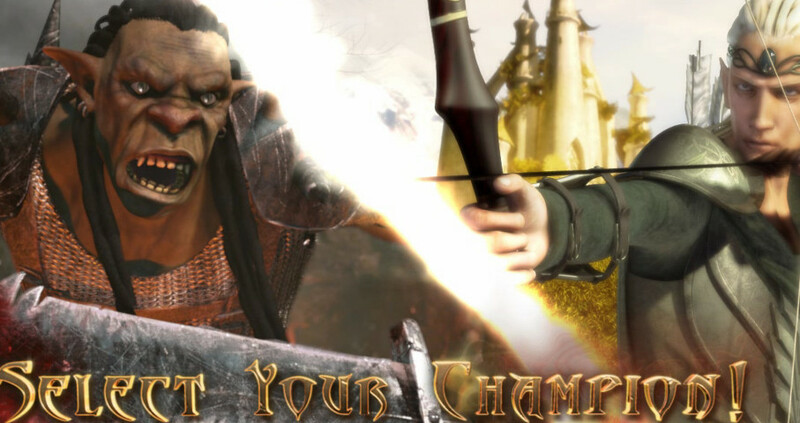 Its games run fast and smooth with top-notch graphics, and come with a lot of exciting bonuses. What’s more, it gives the casino portal’s manager the freedom to modify game rules, pay tables, payback percentages, and other settings. The downloadable software from RTG comes with graphics that are bit crisper than those found in the Instant Play environment. But that’s to be expected since the graphics require more native resources. One last note about Realtime Gaming software: a lot of gamblers feel it offers the best video poker variants among all casino software developers. That alone makes it worth checking out. Most of these options will result in fund being added instantly to your account. The exceptions are Bitcoin, which can take up to an hour, and money transfers. Keep in mind when making deposits with a credit card that occasional transactions may not go through. That’s not the casino’s fault. It’s usually a matter of the transactions being flagged by the credit card company. If this happens to you, contact your card issuer or try another credit card or deposit option. Clearly, Uptown Aces considers support to be important. That’s definitely a checkmark in its favor. Excellent reputation from players and business partners. A 400% deposit bonus with a $25 minimum is nice. No live web-cam dealer games. I like Uptown Aces Casino. A lot. They’ve been aggressive in attracting new players with generous and flexible bonuses. They also encourage existing players to keep coming back via ongoing promotions and lots of perks through the VIP program. I’m going to add this casino to my list of favorite places to play. But those are small quibbles. Overall, I’d give Uptown Aces a solid B+. In my opinion, this casino is worth visiting and registering an account. I recommend taking it for a test drive and seeing for yourself whether it offers the online gambling experience you seek.